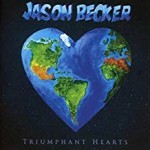 Share the post "Album review: JASON BECKER – Triumphant Heart"
Without overlooking the desperate circumstances of guitar virtuoso Jason Becker being stricken by motor neurone disease, the idea of an album filled with some of the greatest rock guitarist of our time playing mostly his music, isn’t necessarily one that fills the heart with as much optimism as you might imagine, particularly as similar projects all too often fail to live up to their potential. No such problem here though, as every single contribution taps into the spirit of the project and the collective love for a musician who even when robbed of his vital faculties is still capable of writing some great music. The uplifting orchestral ‘Triumphant Heart’ – with a spell binding violin from Glauco Bertagnin and a significant guitar part from Marty Friedman – acts as an overture to an album that surprises with its twist and turns and wide ranging stylist endeavours. Rock fans may have to explore unfamiliar musical territory to source the stellar solos and the delightful ensemble interplay, but as on the big autobiographical rock ballad ‘Hold On To Love’ persistence pays off. This track is the touchstone of the album as a whole. It might arguably have been better placed as the finale, because its shifts from being a vocal-led piece to a startling big rock guitar and gospel finish, worthy of ending any album. However, in keeping with Becker’s exploration of evocative melodies, the album bravely follows with the orchestral-led ‘Fantasy Weaver’. While vocalist Codany Holiday really get inside the lyrics on ‘Hold On To Love’ with falsetto vocal gymnastics over Marty Freidman’s Gilmour style guitar that evokes feel and meaning, ‘Fantasy Weaver’ is all about restraint. It showcases the delicate touch of ukelele player Jake Shimabukuro and some gently plucked harp either side of some over bearing strings. ‘Triumphant Heart’ is an unexpected delight in which the incredible roster of guitarists whose contributions that never lose sight of Becker’s compositional intent or feel. It might have warranted a 5 star review were it not for the fact the album simply tries to incorporate too much and as a result it hinders the sense of flow. ‘We Are One’ for example, brings stark contrast with a harmony vocal intro and some trumpet led funk to frame a mix of both Becker’ more languid and wah wah inflected guitar lines, on a track that works its way back to the titular hook. It’s an impressive track on its own, but sits uneasily between the sonorous ‘Once Upon A Melody’ and the delicate ‘Magic Woman’. The former features 3 Becker samples (including one of him as a 3 year old), on a sonorous piece full of violin and reed interplay and a curiously stop-start midpoint that ushers in Jason’s whammy bar guitar solo and an ambient finish. ‘Magic Woman’ is notably different again, with Chris Broderick on gentle acoustic and Uli Jon Roth on whammy bar electric applying their notes like a painters brushstrokes. The cover of Dylan’s ‘Blowing In the Wind’ while retaining its poignancy feels out of place and the idea of juxtaposing Trevor Rabin’s beautiful rendition of ‘River of Longing’ – complete with its majestic choral ending – with a couple of archive David Lee Roth era dirt toned shreds, certainly redresses the album’s equilibrium, but acts as a shock to the system. No matter, ‘Triumphant Hearts’ makes a joyous statement about Becker’s enduring creativity in the face of incredible adversity and the fact he is still a major catalyst to his contemporaries. This is best evidenced by the outstanding ‘Valley Of Fire’ which features the 13 big hitters, namely Joe Satriani, Steve Vai, Neal Schon, Steve Morse, Paul Gilbert, Joe Bonamassa, Marty Friedman, Michael Lee Firkins, Mattias IA Eklundh, Greg Howe, Jeff Loomis, Richie Kotzen, Gus G, Steve Hunter and Ben Woods. The track remarkably incorporates all the different playing styles, shreds, and the sheer collective intensity into one coherent whole. You can’t help but feel that having pulled that off, anything is possible. The surprisingly sparse arrangement leaves plenty of room for each contribution without decimating another marvellous melody as the notes sparkle, jangle and ultimately resonate in unison on a stunning track. This entry was posted in ALBUM REVIEWS, ALBUM REVIEWS (Mobile), All Posts and tagged Ben Woods, Bob Dylan, but acts as a shock to the system. No matter, certainly redresses the album’s equilibrium, Chris Broderick, Codany Holiday, Dave Gilmour, David Lee Roth, David Lee Roth era dirt toned shreds, funk, Glauco Bertagnin, Greg Howe, guitar, Gus G, Jake Shimabukuro, Jason Becker, Jeff Loomis, Joe Bonamassa, Marty Friedman, Mattias IA Eklundh, Michael Lee Firkins, namely Joe Satriani, Neal Schon, orchestral, Paul Gilbert, Richie Kotzen, rock, Steve Hunter, Steve Morse, Steve Vai, Trevor Rabin, Triumphant Heart, Uli Jon Roth, ‘Triumphant Hearts’ makes a joyous statement about Becker’s enduring creativity in the face of incredible adversity and the fact he is still a major catalyst to his contemporaries. This is best eviden. Bookmark the permalink.